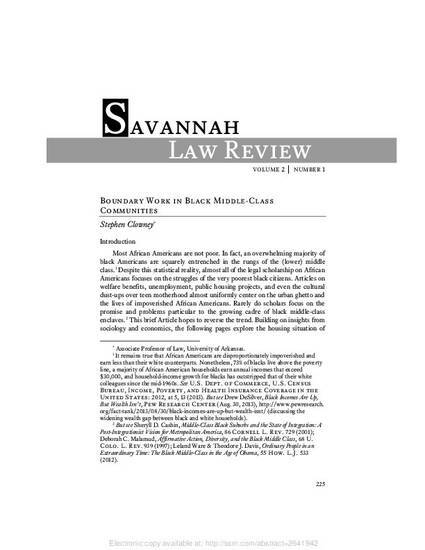 This piece, written for the "Re-Integrating Spaces" symposium at Savannah Law School, explores the spatial reality of black middle-class communities. Most African-Americans are not poor. In fact, an overwhelming majority of black Americans are squarely entrenched in the rungs of the (lower) middle class. Despite this statistical reality, almost all of the legal scholarship on African-Americans focuses on the struggles of the very poorest black citizens. This brief Article hopes to reverse the trend. Building on insights from sociology and economics, the following pages explore the housing situation of middle-class African-Americans and the resulting geographic setting of non-poor black neighborhoods. In short, this Article asks three questions: (1) Where do black strivers live? (2) Why does it matter? and (3) Can the law mitigate the spatial phenomena that restrict black achievement? Section I recaps an emerging body of empirical research showing that middle-class black workers reside in communities that are qualitatively worse than their white counterparts. Section II explains how the unique geography of middle-class black life erodes the physical health of African American strivers, threatens the transmission of middle-class values from one generation to the next, and makes it difficult for families to pass on hard-won economic gains to their children. Finally, Section III presents five brief policy proposals that could help reinvigorate middle-class black neighborhoods and spark a sustainable revival of urban environments. Instead of focusing on grandiose but unachievable plans to reformulate the American economy or reanimate public-sector unions, decision-makers should put increased emphasis on: creating new historic preservation districts in black neighborhoods; granting middle-class African Americans greater autonomy from their less well-off black peers; improving public transportation; strengthening school choice programs; and reformulating inheritance rules to prevent irresponsible children from taking over the property of their parents.